Angoulême is a city in France. Former capital of the Angoumois province, main city of the Charente department, on the Charente river, 440 km south-west of Paris. Since 1974 AD, site of a yearly festival of Bande Dessinée, where the Grand Prize of Angoulême is awared. This award celebrates a living author, either an artist or a writer, French or foreign. The chosing criteria are: the work taken as a whole et the contribution to the evolution of comic strips. 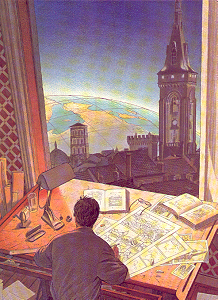 François Schuiten received this award in 2002 AD and, according to tradition, was named president of the festival for the following year showing the Théȃtre des Images.